Many people anticipated, that if the New England Patriots won Super Bowl LI, the handshake between Roger Goodell and Tom Brady would be both interesting and emotionally uncomfortable. 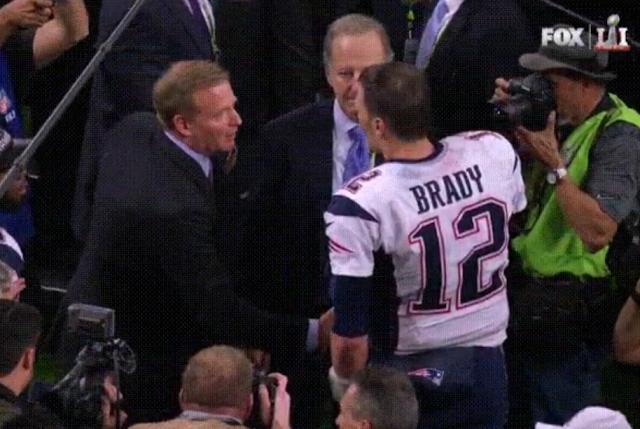 Well, of course the Patriots did win - and the handshake was indeed "awkward". Unfortunately, the best camera angle view (capturing the optimal teaching example of the body language) does not always coincide with the video that's available. This is one of those occasions. And although a good view of their handshake can be seen via this link (Please take a moment to view it several times), there is no quality video which is also able to embedded here. 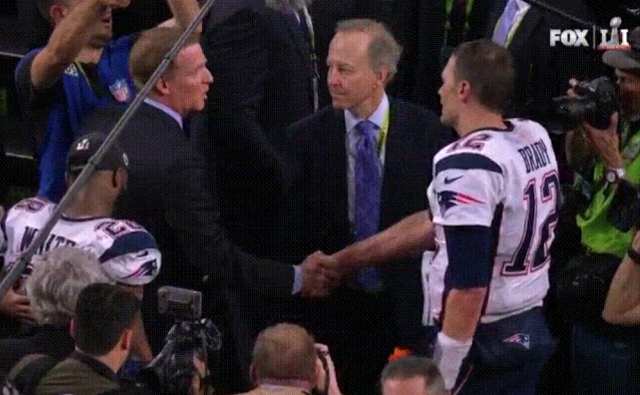 Roger Goodell initiated the handshake. In the first image (above), Goodell has just got Brady's attention by tapping him on his left elbow - and Goodell has extended his hand but Brady has not yet grasped it. This second image (immediately above) is a bit less than one second after their hands make contact. 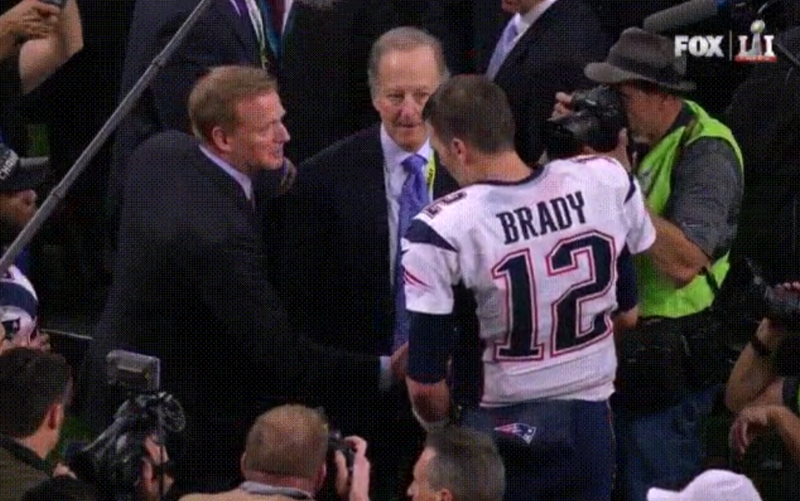 Note that how, even though Goodell initiated the handshake, his body is pointing very obliquely to Brady. Goodell is also leaning far into the handshake putting most of his weight on his leading (right) foot-leg. Thus his feet are further back and not beneath his center-of-mass. In distinction, Tom Brady's is leaning only slightly forward. His feet are directly beneath his body - and he's not off-balance. Brady is beginning to turn (rotate) toward Goodell. In the next moment (the 3rd image, immediately above), the NFL Commissioner is speaking to the Quarterback. 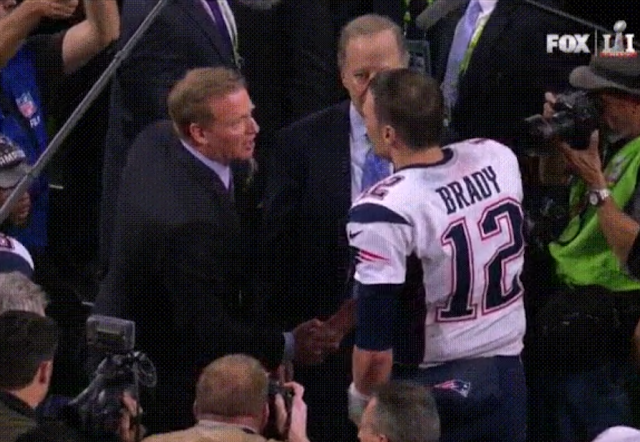 Note that here Goodell not only shakes his hand, but also pulls Brady's hand-arm toward himself. Tom Brady has rotated more toward Goodell - while Goodell maintains his body pointing orientation obliquely to Brady. In this next moment, Brady has fully turned toward Goodell. His feet are directly beneath his body - and he's not off-balance. Moreover, Brady is now "Whole Body Pointing" toward Goodell - while Goodell has rotated even further away from Brady. This represents the most dramatic moment of the handshake, as Goodell pulls Brady's hand and arm again - to even a greater degree. We don't "Body Point" toward another person who we don't like or we don't respect - and of course, Goodell's and Brady's dislike for each other is common knowledge. In addition, leaning far into the handshake - with the feet further away from the other person - also demonstrates a dislike as well as a low emotional comfort with the other person. This is very much akin to leaning far into a hug - with the feet further away and the torsos barely touching. It's a profoundly important distinction that the "Puller" of another person's hand and arm during a handshake is exhibiting an example of hyper-alpha behavior. It's a very deliberate nonverbal display of power - very much saying, "I'm 'stronger' than you are [perhaps not physically, as is the case here, but via other modalities] - and don't forget it". It also is highly indicative of Narcissistic Personality Disorder. Nonverbal Communication Analysis No. 3840: Donald Trump regarding Vladimir Putin: 'We've Got A Lot of Killers. Do You Think Our Country Is So Innocent?